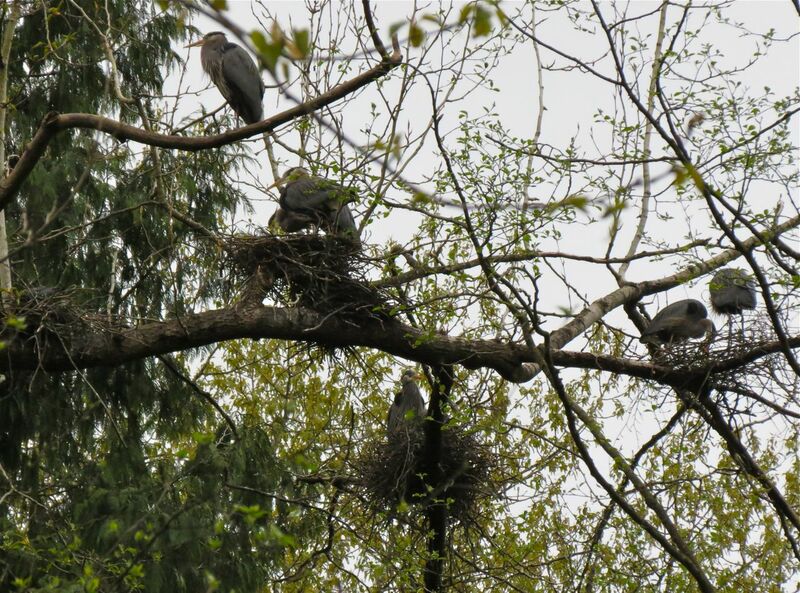 Within sight of Burnaby’s City Hall, the word is out that Great Blue Herons have constructed a huge and rapidly growing colony, and they’ve done it all without a building permit! 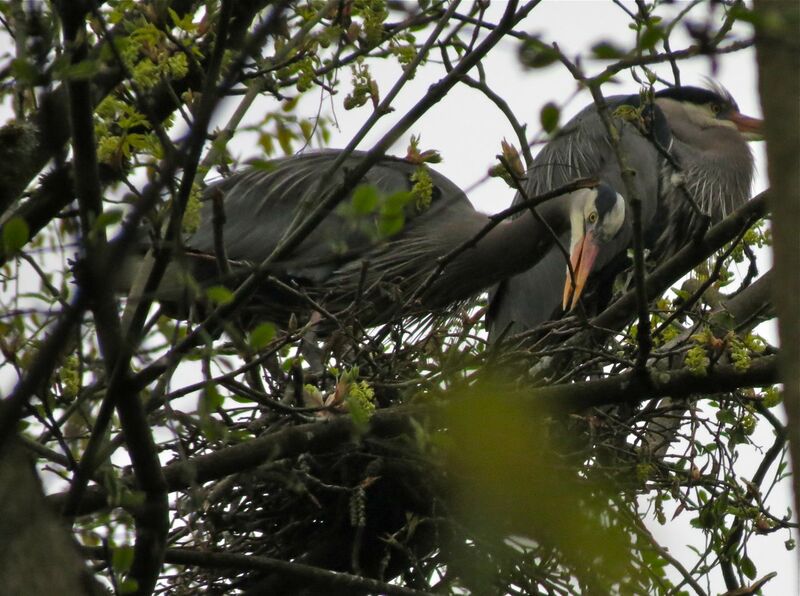 It’s nesting season, and right now there’s so much going on in the colony at Deer Lake Park, it’s definitely time for us to get out there, take a look, and enjoy all the action. Great Blue Heron grabs a tree branch to add to its nest of sticks. So head down to Deer Lake Avenue, opposite City Hall, to enjoy the sights and sounds. However, please watch only from the paths and the sidewalks. Entering the colony under the nests is definitely a No No. Peering in from the edges of the colony gives the best views of the birds, their nests, and all the goings on. Standing under the nests is unwise for many reasons, especially when looking up, mouth agape. Sticks are searched for diligently within the colony. or carried in from further afield. Sticks are being gathered, nests built, nest sites squabbled over, and the occasional predator is vanquished. Egg-laying will start soon, if it hasn’t already, and after about 30 days incubation, the young will hatch. Following hatching, it takes another two months before the young fledge. And as the young grow, noise levels will rise, as will the colony’s strong, olfactory presence. Yes, it gets pretty stinky, and furthermore, later in the season the trees will be fully leafed-out, and activities harder to see. Now is a very good time to pay a visit. For the past six years, much to the delight of park users, passers-by, interested scientists, and City and Ministry of Environment staff, the Deer Lake heronry has been growing in size at a fantastic rate. It has made a big jump in numbers this year. Don Jones, who, every season makes a very careful inventory of the nests, counted 104 in March. Last year (2012) the count was 66 nests – a whopping increase! 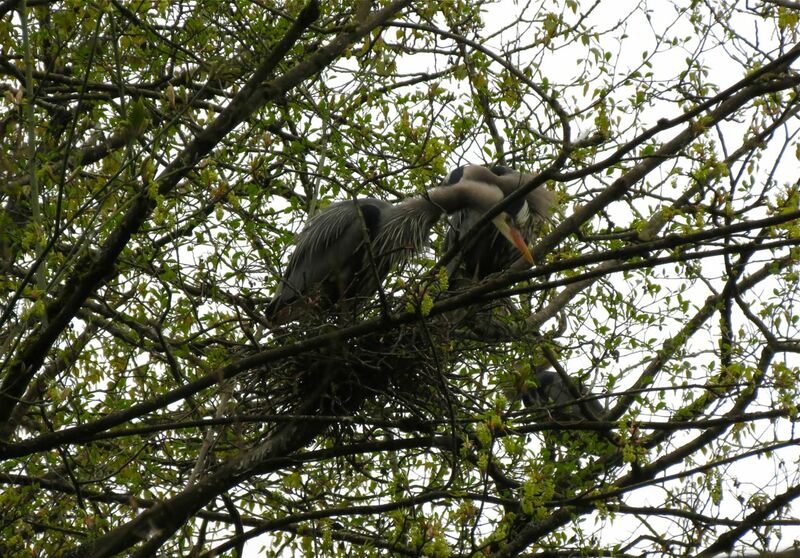 As each nest represents a pair of herons, we now have over 200 birds using the colony. That’s a huge number of these big, spectacular birds. ”There has been a small colony (2-3 pairs) of GBHE at the west end of the lake for the past 4 years. Last year (2007) the colony was predated by Bald Eagles, and no young were fledged. Up to three young were fledged, or were close to fledging in previous years. This year the birds, presumably the same ones, relocated north and east of the previous location to a grove of black cottonwoods bounded on the south by Price St., on the north by Deer Lake Drive, and on the west by the trail that heads north-east diagonally from the foot of Price. 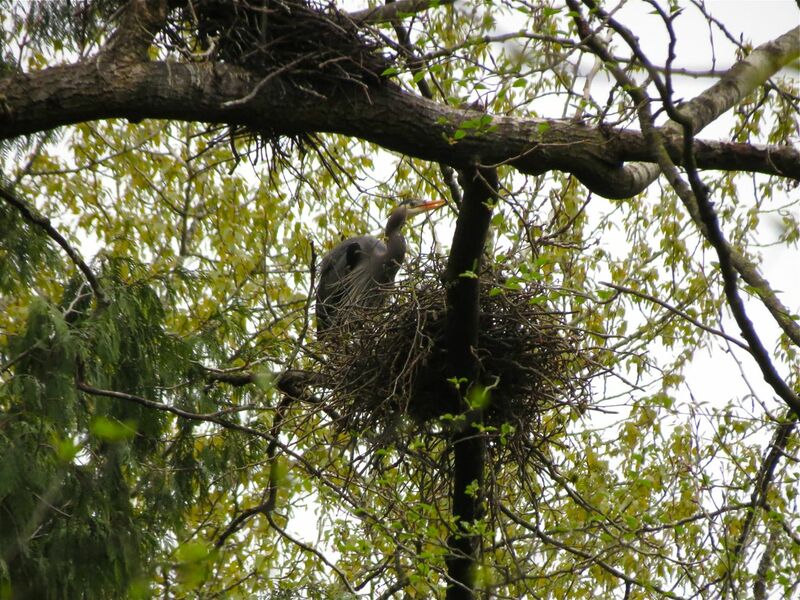 In early May, three nests were visible with adults standing on and/or next to two of the nests. 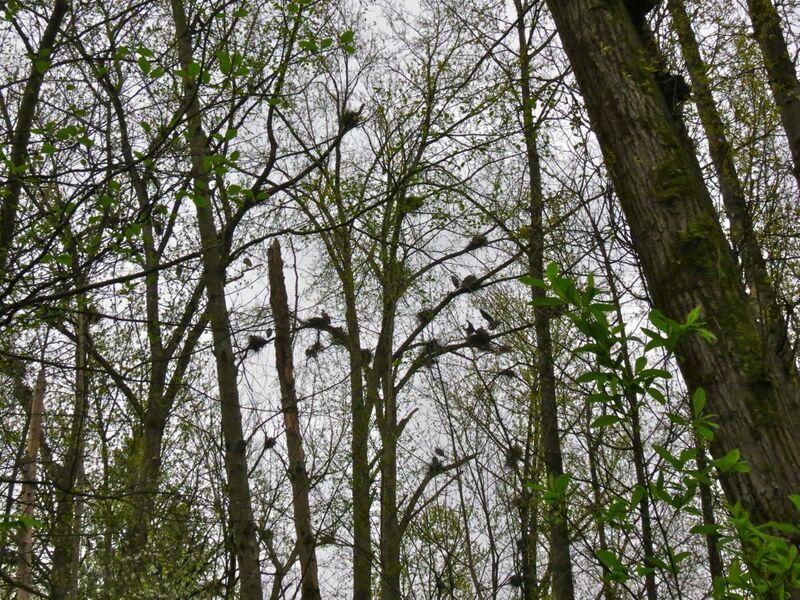 On May 30, the leafing-out of the trees made observing the nests very difficult. Only the southern-most nest was fully visible, and an adult was sitting (presumably incubating) on it. The second nest was mostly concealed, and its top was not visible. The third nest was not visible at all. So, from three nests in 2008 the colony has now grown to over one hundred nests. It seems that herons take note of which colonies are being successful, and will transfer to these new locations from others where conditions may not be as good. In fact, the transfer from another colony seems to be a likely cause of this year’s big jump in numbers. 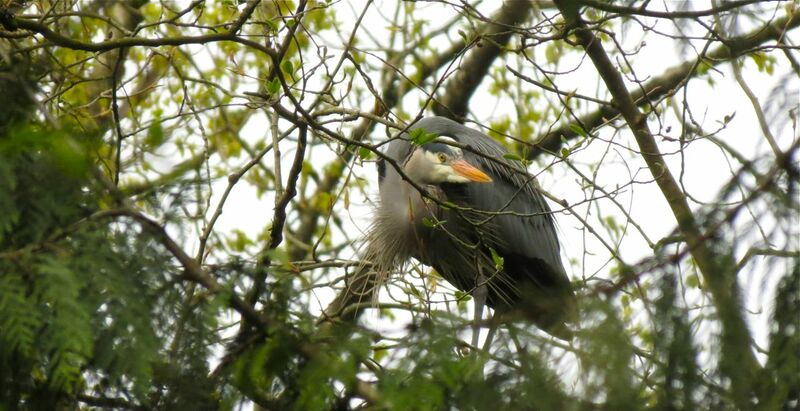 The Colony Farm heronry, visible along the Mary Hill Bypass in Coquitlam, has been abandoned this year, likely due to nearby bridge construction at the start of nesting season. The Deer Lake colony may well be attracting some of the birds from the Colony Farm heronry. Bald Eagle incursions are also a problem for heron colonies. Bald Eagle attacks frequently cause colonies to be abandoned. Both the Deer Lake and the Colony Farm colonies have suffered from eagle attacks. However, Don Jones reported a very interesting observation at the Deer Lake colony this year. A Bald Eagle entered the colony, but was attacked strongly (pecked from above) by one of the herons. The other herons didn’t abandon, but just retreated a short distance. The eagle was finally driven away pursued by a heron. It makes me hopeful that perhaps the birds are learning strategies to defend their nests, even at this relatively early stage in the breeding season. Sticks are worked into place to build the nest. Some nests are quite substantial structures. Activities other than nest building are also taking place in the colony. Unfortunately, I didn’t manage to get a picture, but frequent copulations are happening. Despite that miss, I did, manage to capture some tender moments of mutual preening by a nesting pair. Copulation, and mutual preening as shown here, both take place on or adjacent to the nest. I was recently asked, if there are so many birds on the colony, how come we only see one or two in the park itself? Great Blue Herons will travel long distances (5 to 10 kms) to good feeding areas to forage. Watching the direction of birds flying to and from this colony suggests they are probably foraging along Burrard Inlet, and as far south as Boundary Bay. Both locations are within easy flying distance. Some individuals do forage locally, and there are frequently one or two birds in Deer Lake Park itself. Some may not go as far as the Inlet or Boundary Bay. I managed to capture this not-very-good picture just a couple of days ago along Chub Creek, a tributary of Still Creek, of a heron just about to swallow its prey. I suspect it was fishing, but made this opportunistic capture instead. 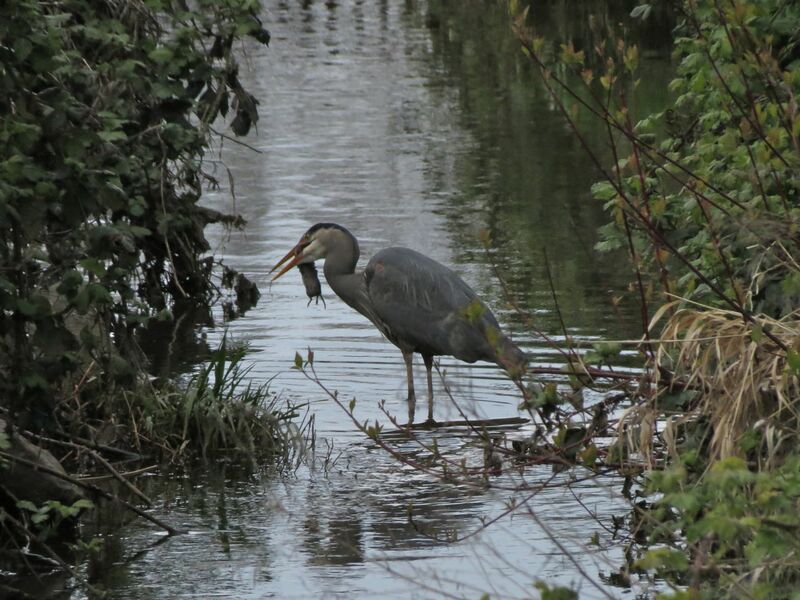 Great Blue Heron about to swallow a Townsend’s vole captured along the banks of Chub Creek. It’s wonderful to have a such a success story on our doorstep, and we should celebrate our good fortune. 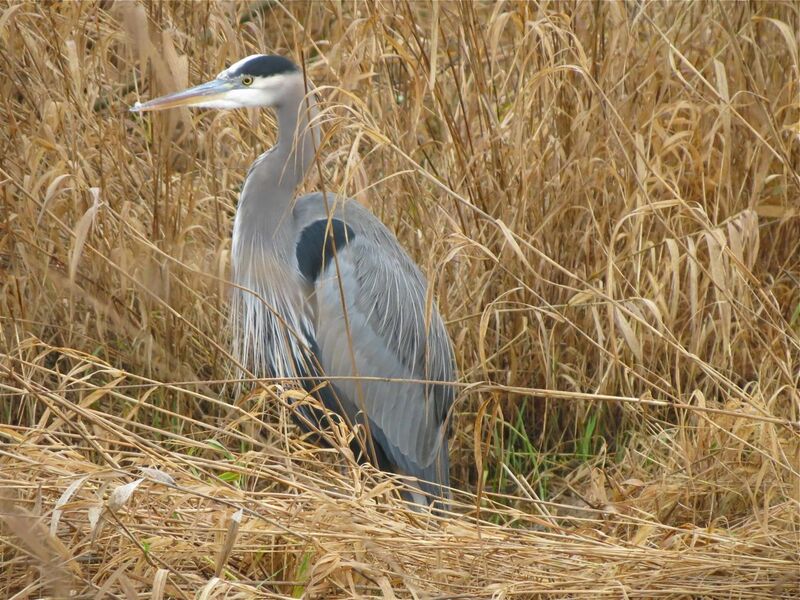 However, we shouldn’t be complacent about the threats to the Great Blue Heron. 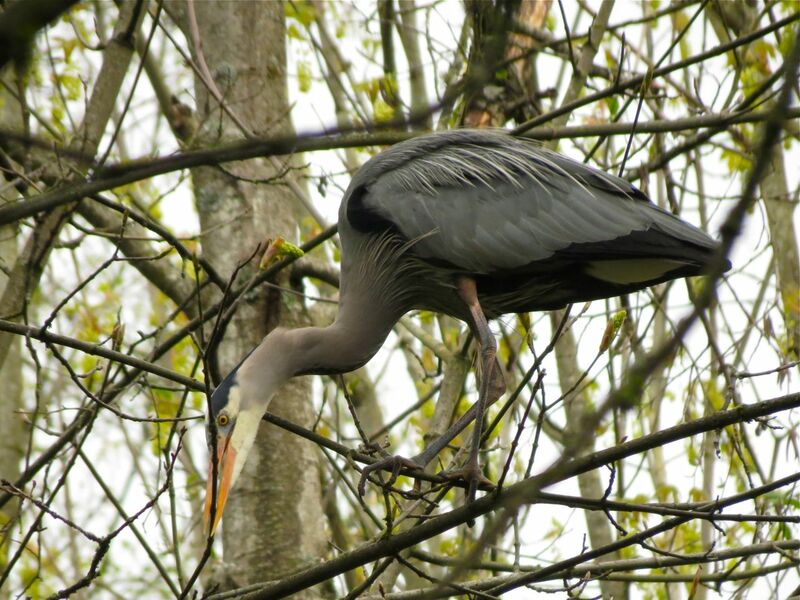 We have a special, non-migratory subspecies here on the BC coast (Ardea herodias fannini), and it is designated a “Species of Special Concern” due to loss of wetland habitat in the Georgia Basin, and a declining population. And not to be forgotten, too, is how this success story illustrates the importance of preserving the natural areas in our parks. In the 1980’s, the stand of black cottonwoods in which this colony has now established itself was designated for paving as a parking lot for the park. Thankfully, this City-inspired plan for the Park is long abandoned, and we now live in more enlightened times in Burnaby. Thirty years ago this stand of trees was seen as dispensable. Today, completely unpredictably, it has become a significant colony for this threatened bird. A great example of why the precautionary principle is best applied consistently, especially to our natural areas. Great Blue Heron foraging at Deer Lake. Let’s hope the success of our local colony will help us continue to enjoy these magnificent birds. If you’ve been wondering why no posts lately, it’s because I’ve been travelling in South East Asia – birding of course. Posts should pick up to a regular pace from now on. Thanks for your patience.